Participate in the "2014 Private Duty Benchmarking Study"
Due to repetitive weather-related issues across the United States over the past few weeks, Home Care Pulse extended the participation deadline of the “2014 Private Duty Benchmarking Study” until Sunday, March 23. We encourage you to participate in this important industry survey. Download and print the prep worksheet. Fill in as many of your home care agency’s numbers as you can. Schedule 15 minutes of uninterrupted time to take the online survey. Use your completed worksheet to get through the survey quickly. Keep your worksheet all year so you can refer back to your numbers anytime. Through your participation, you will get a personalized report comparing your company to the benchmarks in the industry. 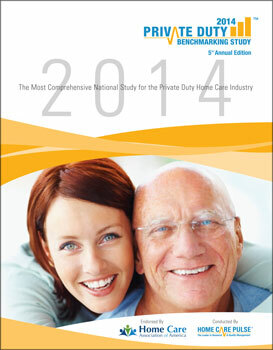 If you haven’t participated yet, please visit www.benchmarking.homecarepulse.com to take the survey before it closes on March 23.